Ballard's CoPilot, available from Dedicated Systems Australia , is an advanced databus test, simulation and analysis software. CoPilot, coupled with one or more of Ballard's hardware products, provides a single solution, simultaneously supporting MIL-STD-1553, ARINC 429, ARINC 664/AFDX and ARINC 708 databuses. Using the auto-detection features and the intuitive and interactive graphical interface, users can quickly and easily evaluate databus activity, view and interact with data, and optimise CoPilot for each application. All configurations and data can be saved for later reuse or analysis by CoPilot or other applications. Monitor, analyse, simulate and replay bus activity across multiple boards and protocols. Save/reuse data, projects, conversions, scripts, and layouts. Define and examine information through an analyser view. Performance monitor captures and displays error rates and other statistical information. Data representation - raw values or engineering units in current values, lists, or graphically. 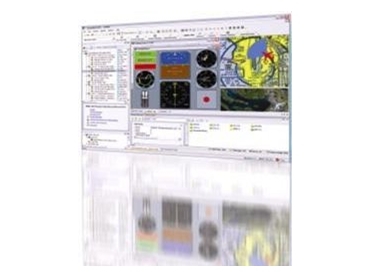 Graphical displays - large selection of ActiveX controls including aircraft instruments, strip charts, and moving maps. Monitor - sequential recording and time-tagging of all or selective data for real-time display or subsequent analysis. Users can replay monitored data in software or by transmitting through hardware. Database of message definitions, equipment configurations, data conversions and graphical links are either user created or imported through XML. CoPilot not only offers databus analyser features, it also provides an automated test environment (ATE) for test development, test management, and integration with other hardware and software applications. Within CoPilot's ATE are development and management tools to facilitate the creation, customisation, integration, distribution, control, and use of test procedures. Using the auto-detection features and the intuitive and interactive graphical interface, users can quickly and easily evaluate databus activity, view and interact with data, and author run-time projects that are optimised and locked down for a specific test application.